Meta-analyses of genome-wide association studies (GWASs) have become essential to identifying new loci associated with human diseases. We recently developed a novel framework that improves the accuracy and power of meta-analyses, which we describe in our recent Human Molecular Genetics paper. This framework can be applied to the fixed effects (FE) model, which assumes that effect sizes of genetic variants are constant across studies, and the random effects (RE) model, which assumes that effect sizes can be different among studies. Almost all GWAS publications today employ meta-analysis methodologies, the majority of which assume that component studies are independent and that individuals among studies are unrelated. Yet many studies today use shared controls to reduce genotyping or sequencing cost. These “shared control” individuals can inadvertently overlap between multiple studies and, if not accounted for in the methodology, induce false associations in GWAS results. Most meta-analysis tools, including the RE model, cannot account for these overlapping subjects. In our paper, we propose a general framework for adjusting association statistics to account for overlapping subjects within a meta-analysis. The key idea of our method is to transform the covariance structure of the data so it can be used in methods that strictly assume independence between studies. Specifically, our method decouples dependent studies into independent studies and adjusts association statistics to account for uncertainties in dependent studies. As a result, our approach enables general meta-analysis methods, including the FE and RE models, to account for overlapping subjects. Existing pipelines implementing these models can be reused for dependent studies if our framework is applied at the front end of the analysis procedure. A simple example of our decoupling approach. Ω and ΩDecoupled are the covariance matrices of the statistics of three studies A, B and C before and after decoupling, respectively. The thickness of the edges denotes the amount of correlation between the studies. After decoupling, the size of the nodes reflects the information that the studies contain in terms of the inverse variance. We tested our framework for accuracy and power with five simulated datasets, each containing 1000 to 5000 individuals and 10,000 shared controls. A standard approach produced an inflated number of false positive. 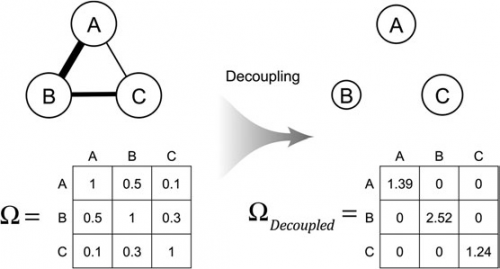 Our decoupling method, which systemically accounts for overlapping individuals in meta-analysis, and a standard splitting method, which splits controls into individual studies, both correctly controlled for type 1 errors. The advantage of our framework is apparent when assessing power; in one scenario, we gained 25% power in accounting for overlapping subjects with the decoupling when compared to the splitting method. Next, we assessed the potential of our framework in identifying casual loci shared by multiple diseases and leveraging information from multiple tissues to increase power for eQTL identification. The decoupling and splitting methods controlled false-positive rates and produced significant p-values at several previously identified candidate shared loci among the three autoimmune conditions present in the Wellcome Trust Case Control Consortium (WTCCC) data. 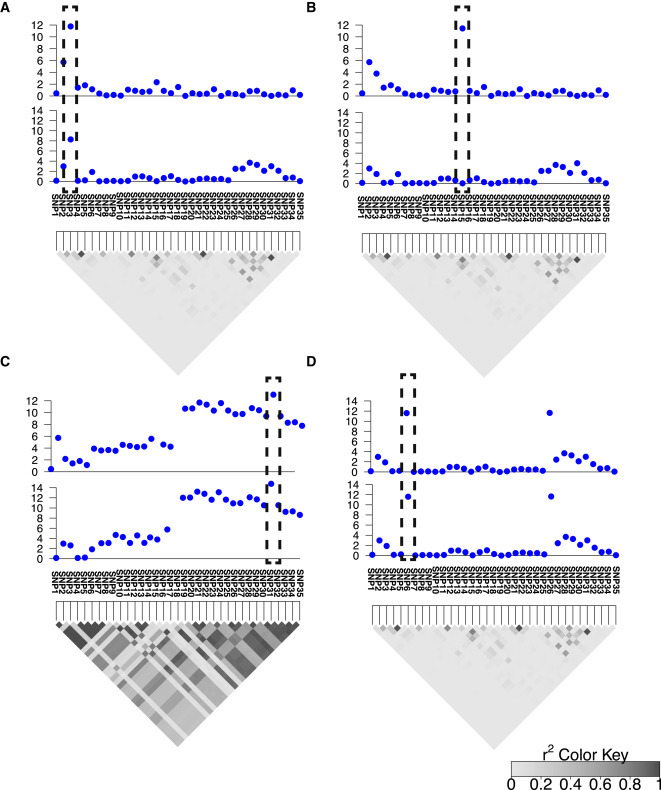 In comparison to the splitting method, our decoupling framework increased the significance of p-values in the shared loci test and increased the number of discovered eQTLs by 19%. In: Hum Mol Genet, 2016, ISSN: 1460-2083.